A typical day in the life of Charley Davidson involves cheating husbands, missing people, errant wives, philandering business owners, and oh yeah…demons, hell hounds, evil gods, and dead people. Lots and lots of dead people. As a part time Private Investigator and full-time Grim Reaper, Charley has to balance the good, the bad, the undead, and those who want her dead. In this eleventh installment, Charley is learning to make peace with the fact that she is a goddess with all kinds of power and that her own daughter has been born to save the world from total destruction. But the forces of hell are determined to see Charley banished forever to the darkest corners of another dimension. With the son of Satan himself as her husband and world-rocking lover, maybe Charley can find a way to have her happily ever after after all. 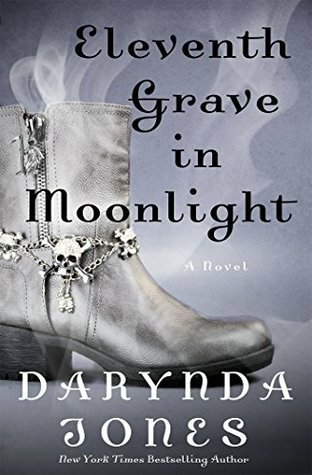 Is there is one thing I can tell, it’s that Darynda Jones knows no limit to made her characters suffering. We are learning a lot of things in this eleventh book, about Charley but also about Reyes. I found them interesting but I would have love for them to be happy in the end, they deserve a little happiness and the more I read this series and the less they are happy. Charley must find the truth about the Fosters, Reyes doesn’t want her to take this case, Uncle Bob’s wants her to be home always. The men of her life are ordering her around and she is upset and doesn’t listen. It brings her in some bad situation and even if she must do something about it, she learns some hard truth about herself. Reyes is overprotective with Charley, he has his own reasons and doesn’t want to share them with her. I like the way Reyes teach Charley to teleport herself, it’s very funny. They are a perfect couple, they understand each other and their love is magical. Amber is the center of a story, and all the team is here for her, they protect her as best as they can and it’s wonderful to see the love between all these characters. Amber will be a great woman one day and an important one in team Beep. I like this book but this end is so awful, I need some magical love in the Twelfth book because I can’t leave book Nine again, it was not a great book for me. There is so much darkness that I need Charley and Reyes to be in love, no matter what. Quick Word: Another great story with Charley and Reyes and a big cliffhanger.